While Urawa Reds and Kawasaki Frontale battle to clinch the top seed for the J. League Championship on the final day of the regular season on Thursday, a more decisive tussle will be going on at the other end of the table. Four teams are in danger of taking the last remaining relegation place going into Thursday’s matches, with Nagoya Grampus, Albirex Niigata, Ventforet Kofu and Jubilo Iwata all striving to avoid joining already doomed Avispa Fukuoka and Shonan Bellmare in J2 next season. Grampus, one of only three clubs — along with Kashima Antlers and Yokohama F. Marinos — to have competed in J1 every season since the J. League was founded, currently occupy the final relegation spot on 30 points, with Albirex leading them only on goal difference. Ventforet are one point better off on 31, while Jubilo, currently on 33, look best placed to survive. Nothing will be decided until 3:30 p.m. on Thursday, however, and an intriguing set of fixtures makes it impossible to predict which of the four teams will go down. Nagoya, the side currently in the stickiest predicament, also has what looks like the easiest assignment, hosting a Bellmare side that has picked up only 24 points all season. Albirex face a Sanfrecce Hiroshima team that has made a mess of its J. League title defense, while Ventforet and Jubilo take on Sagan Tosu and Vegalta Sendai, respectively — both midtable teams. Wins for any of the relegation-threatened clubs is certainly a possibility, but so too is a repeat of the hapless performance that saw all four teams lose last Saturday. Should goal difference come into play, Jubilo hold the advantage on minus-14, with Albirex on minus-15, Grampus on minus-18 and Ventforet lagging far behind on minus-25. 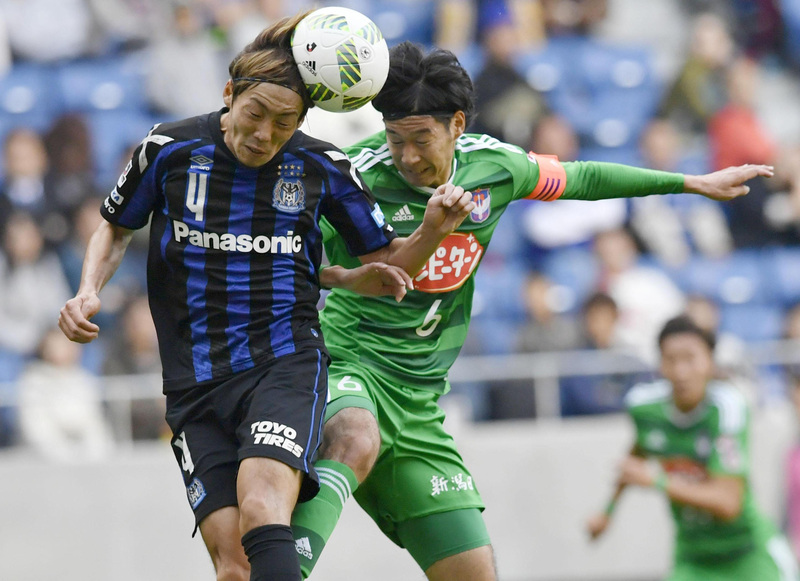 “I was thinking about a lot of different things in the buildup to the game, but given the result, I think I got my tactics wrong,” Ventforet manager Satoru Sakuma said after Saturday’s 1-0 loss to Bellmare. For all four teams in Thursday’s final round of games, any further mistakes could prove fatal. Staging post: Urawa Reds clinched the second-stage title with a 1-0 win over Jubilo Iwata on Saturday, but the peculiarities of the current league format means the achievement brought the Saitama side absolutely no reward. Reds had already qualified for the J. League Championship by virtue of their guaranteed top-three finish in the overall table — which outranks stage wins — and captain Yuki Abe was more concerned about claiming the direct spot in the championship final that comes with finishing first. 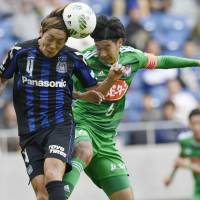 “We still have to play Yokohama F. Marinos, and each step from here on is vital,” said Abe, whose side leads Kawasaki Frontale by one point going into Thursday’s final regular-season game at home to Marinos. Thirteenth century: Gamba Osaka have only the Emperor’s Cup left to play for this season after missing out on the J. League Championship, but midfielder Yasuhito Endo achieved a personal landmark with his 100th career J1 goal on Saturday. Endo slotted home a penalty in Gamba’s 3-1 win over Albirex Niigata to make him the 13th player to achieve the feat and only the second midfielder, following in the footsteps of former Jubilo Iwata playmaker Toshiya Fujita. “Of course it makes me happy,” said the 36-year-old Endo. “It’s not something that many players have achieved. Sanfrecce Hiroshima’s Koji Morisaki enjoys his final home league game before hanging up his boots, after scoring in Sanfrecce’s 4-1 win over Avispa Fukuoka on Saturday.